Great scenery and activities in a totally private setting make Xigera a wonderful area. Activities are very much dependent on flood levels, in years of low flood, activities tend more towards game drives, mainly water based activities will be offered through the flood season. 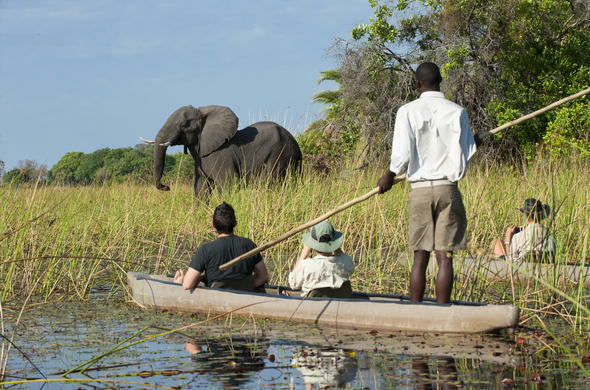 Activities focus mainly on mokoro rides through the quiet waterways, as well as short walking safaris. Many guests on this Botswana safari are lucky enough to get good views of the elusive Sitatunga Antelope. Game drives are best here in the summer months. Birding in the area is excellent, with Pels Fishing Owl, Slaty Egret and Wattled Crane amongst the many species of birds regularly sighted. Xigera has exclusive rights to this area, providing a tranquil and private setting for its guests. Xigera Camp has a unique feature: the footbridge in front of Xigera is the only way predators can cross from island to island without having to swim. A 'long-jump pit' has been built with soft sand, which each animal is forced to walk over when they use the bridge. Every evening the sand is raked smooth. Each morning guests are able to read the 'newspaper' and see what African wildlife have walked through Xigera Camp. Almost every night Lion, Hyena and Leopard stroll through Xigera Camp in Botswana. 20% Game drives, 80% Water activities. Indulge in the mainly water based activities on offer during the flood season. Enjoy mokoro rides through the quiet and fascinating waterways.